The Scrappy Apple, Winchester, VA! 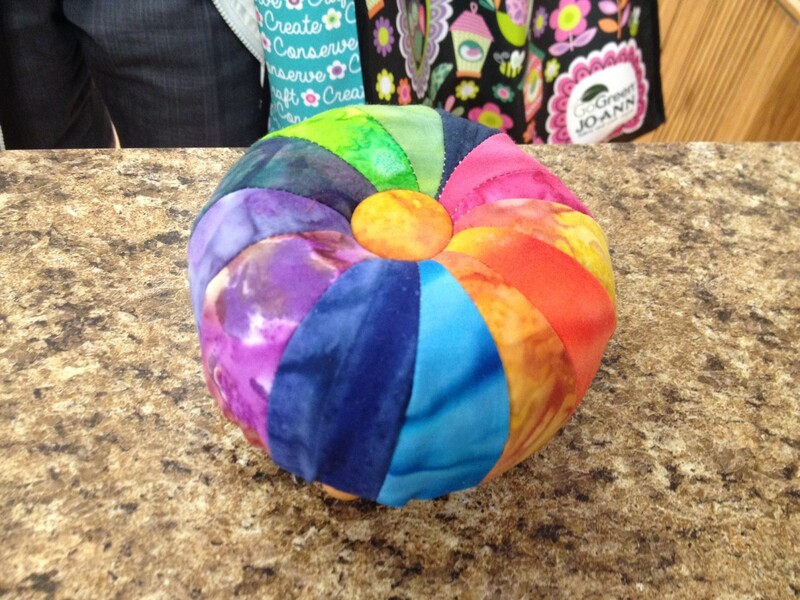 Kelley over at The Scrappy Apple in Winchester, VA. sent me this sweet Color Wheel Pincushion her customer Dot S. had brought in to show her. We were all so excited as I happened to be on the phone with Kelley at the time! What a coincidence! Notice, that Dot used a covered button, it’s the first time I’ve seen that, and isn’t it a good choice. Love the batiks, and the color selection! Kelley will be teaching a class in making the pincushions in April, and will have lots in stock, so stop by to sign up for the class, and to see that and all her other goodies! SWEEEEET! You’re gonna love this pincushion! It’s been so fun to design and make, I’ve made a few already with a variety of fabric collections. It hardly takes any fabric at all, and goes together so fast. Make it today, use it tonight! You’ve seen my big footstool, and this is the “mini-me” version in a 4″ diameter! Perfect for treating yourself, or for gifts. I’ve been able to pull together a kit which includes the foam, crushed walnut shells, tufting cord, felt, instructions and the plywood base with hardware to install your purchased feet. All you add is the fabric and feet! What could be easier! I think I’ll make a truck-load of these, just for the fun of it! When you orderyours, I’ll send it out the next day!